watchOS had a bumpy first few years. Some poor decisions and perhaps a premature initial launch forced significant design changes to be in order right away. It wasn't until last year's watchOS 4 release that it finally felt like the waters had calmed. Apple seemed to have solidified the brunt of its focus around fitness and audio, while also debuting a healthy backdrop of first-party apps, new watch faces, and machine learning features. The Siri watch face was the big addition for both of those last two categories, and while its initial introduction was underwhelming, the ideas behind it were intriguing. The redesigned Workout and Music apps along with background audio during workouts were excellent additions to the Apple Watch's core foundation. All things considered, Apple pushed a great update last year, and it only got better as the year progressed. While it didn't ship in time for watchOS 4's launch in September, streaming from Apple Music was released late the next month in watchOS 4.1. The ability to stream music in the background during workouts freed runners and other athletes from being tied to their phones while they exercised. Paired with the redesigned Workout app – which put live statistics front and center while keeping Now Playing and workout controls just a swipe away – watchOS 4 established a truly better fitness experience for Apple's smartwatch. The audio story that Apple told last year felt much less complete. Despite receiving a significant amount of attention in Apple's marketing efforts, the Apple Watch's music improvements seemed almost strictly geared toward workouts. Background audio was limited to workout apps and withheld from the platform as a whole, the first-party Now Playing screen continued to monopolize possession of volume controls, and the Music app only gave manual access to preselected songs instead of the full music library on your iPhone1. Audio on the Apple Watch had received some strong improvements, but the scope of those positive consequences felt unnecessarily limited. 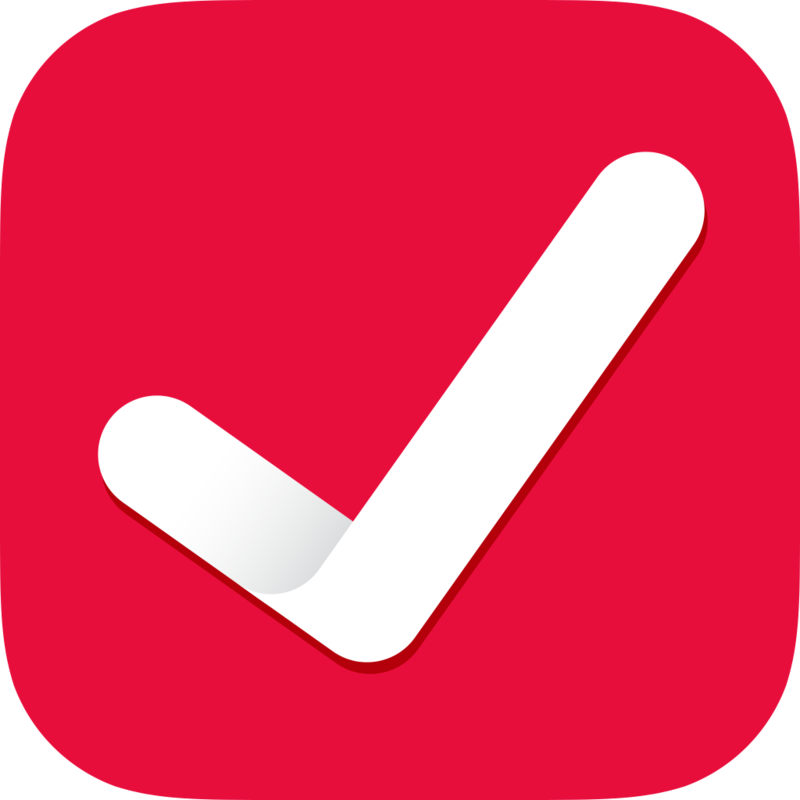 HabitMinder, your healthy habit reminder and tracker. Change your habits, change your life!. Thankfully, Apple seems to agree. This year's watchOS 5 update, released today for all Apple Watches Series 1 and later, fills in the gaps of the watchOS audio feature set. Third-party audio apps can now run in the background, and full audio controls including volume adjustment via the Digital Crown have been made available to them. watchOS 5 also introduces the first-party Podcasts app, which supports automatic syncing of new episodes that you're subscribed to and streaming of any show in the iTunes podcast directory. Beyond audio, watchOS 5 also builds on the solid fitness foundation with activity competitions, expanded Workout types, automatic workout detection, and advanced running statistics. Siri has continued to receive attention as well, introducing third-party integrations to the Siri watch face and a raise-to-speak feature which truncates the inveterate "Hey Siri" prefix for the first time on any platform. A new Walkie-Talkie app marks the first return to novelty Apple Watch communication methods since Digital Touch, but this time I think Apple might have tapped into a legitimate, albeit niche use case. 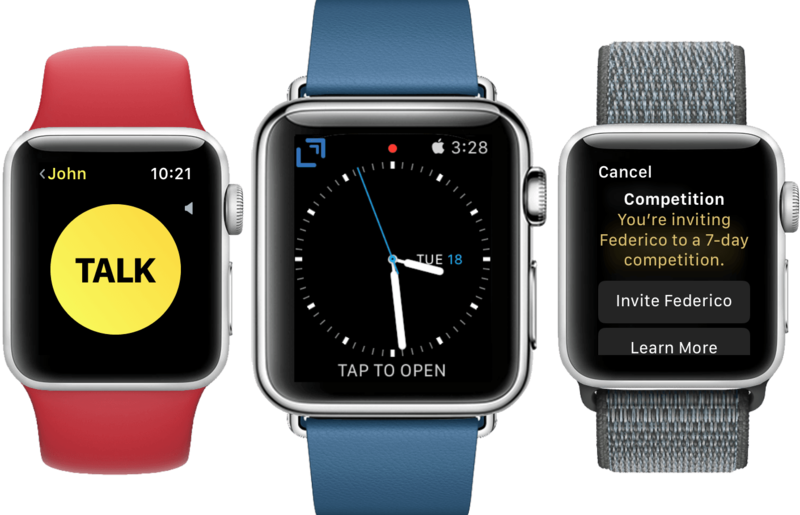 Top things off with improved notifications, the introduction of web content, and NFC-powered student ID cards and we have a substantial watchOS update on our hands. Fitness is clearly the Apple Watch's breakthrough use case, and Apple is not dropping the ball on it for watchOS 5. Automatic workout detection takes aim at one of the biggest frustrations of the Watch's fitness system, new workout types expand fine-grained calorie counting to more audiences, and activity competitions further gamify daily activity streaks. Fitness in watchOS 5 sheds frustrations and boosts accuracy and addiction, an excellent formula for promoting healthier lifestyles for all Apple Watch users. 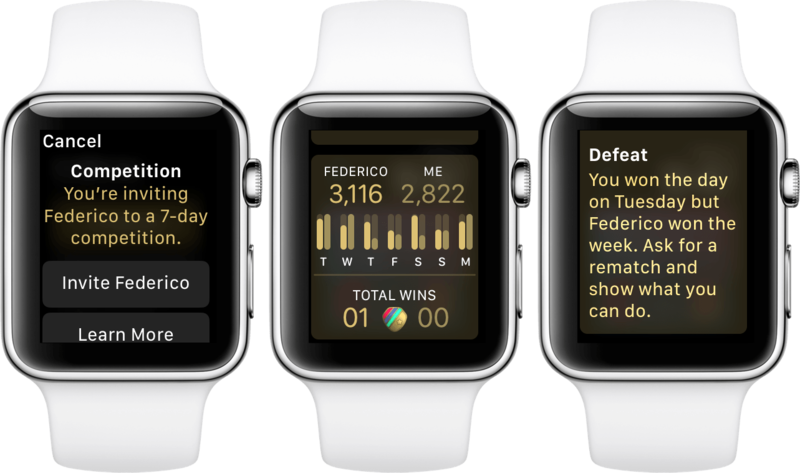 The new competitions feature in watchOS 5 pits you against your friends in seven-day competitions based on the Apple Watch’s three activity metrics: move, exercise, and stand. Competitions can be started via the notifications that you receive when your friends complete workouts, or from the Sharing section of the Apple Watch or iOS Activity apps. Each competition is between you and just one friend, but you can be involved in multiple overlapping competitions if you want to face off against more than one friend at a time. Once a competition request is accepted it will begin the following day. Over the seven days of an activity competition, you and your friend’s activity will be tracked each day to generate points. The points are calculated based on the percentage of each activity metric that you fulfill, and you can both earn a maximum of 600 points each day. At the end of the week the participant with the most points wins the competition. Point calculations are based on a simple formula. Stand, exercise, and move metrics are each worth 100 points if you achieve 100% of your goal for them on a given competition day. If you generate greater than 100% on any of these metrics then you’ll get more points based on that percentage. For example, 200% of your move and exercise goals will get you 200 points for each of those categories. If you stand for all 24 hours of a given day then you can get 200% of your stand goal too, but you’ll have a much easier time hitting 600 points by just pushing move or exercise higher than 200%. The only enforced cap is 600 total points, so if you theoretically achieved 600% of your move goal while getting 0% of your stand and exercise goals then you would still receive 600 points for the day. On the other hand, if you achieved 600% on move and exercise in the same day, you'd still only end up with 600 points. This cap establishes an emphasis on consistency throughout the entire competition. You can't build a huge lead with a couple explosive performances and then coast to the finish line on rest days. The great equalizer of activity competitions is the move goal. Exercise and stand goals for all Apple Watch users are set at 30 minutes and 12 hours, respectively. Move goals on the other hand are set by each user individually. Since competitions generate points based on the percentage achieved for each goal, having your move goal set to a higher calorie count than your opponent creates a handicap. The obvious advantage of this handicap is that Apple Watch users who are less active than their friends can still enjoy competitions with them. The potential disadvantage is that people can easily win competitions just by setting their move goals to significantly lower calorie counts than their opponents. I think Apple made the right choice here; if you’re competing with a friend who’s setting a low calorie count just to win, the solution is to stop competing with that person. If you want to compete with a group of friends instead of just one other person, you’ll need to coordinate to all challenge each other individually and make sure everyone accepts by the end of the same day. If you can make that happen then all of the competitions will begin the following day and proceed for the same period of time. This isn’t ideal since the competitions will all show up as separate entities, but it will at least achieve the outcome you're looking for. Competitions with multiple participants will be an easy win for this feature down the road, and I hope to see Apple implement that by watchOS 6. You can check your status during an active competition at any time from the Activity app’s Sharing section on Apple Watch or iOS. Competitions are shown at the top with each participant's total points and the number of days remaining. You can tap these to expand a more detailed view including your opponent’s activity rings for the current day, the total points for the week and the current points from the day, and a small graph showing the point match-ups from every day of the competition. The graph is fairly featureless, showing only bars on Apple Watch and only bars plus daily points on iOS. I consistently find myself wanting to tap on a particular day to see the breakdown of move/exercise/stand stats for each participant, but unfortunately the graph cannot be interacted with in any way on either watchOS or iOS. Beneath the graph you’ll find a “Total Wins” section which shows the overall results from all competitions you’ve had with this particular friend. You'll also find your friend’s activity statistics from the current day, and a button to send your friend a message. On iOS the send message button is replaced by options to mute notifications for the competition, hide your activity from your friend, or remove your friend entirely. It’s unclear why the “Hide my Activity” button exists in the competition view, because tapping it induces an alert which says you can’t hide activity from a friend while you are competing. If you’re interested in seeing the full details from an earlier day in the competition, you need to go back to the top level of the Sharing tab and scroll down to find the day in question, then tap on the friend that you’re competing with to see their daily breakdown. To see your own daily breakdown you need to back out of there and tap on your own name from the same day. In the future I’d really like to see the graph in the competition view made tappable to expand this head-to-head data in a simpler and more intuitive way. When an activity competition draws to a close, each member is presented with an Activity notification describing either their victory or their defeat, plus a button to kick off a rematch with your opponent. When you complete your first activity competition you’ll receive a Competition Complete award in the Activity app, and if you defeated your opponent you’ll also receive a victory award for that specific friend. Both of these awards are displayed with numbers below them indicating how many competitions you’ve completed and how many times you’ve defeated that friend. As someone who has never drawn much motivation from just filling up my Activity rings every day, I was surprised by how much more motivated I was during my activity competition. I expected to be trounced by Federico’s daily workout regime, but my lower calorie burn goals allowed me to stay in it. I did notice a couple days into the week that my calorie goal was excessively low since I hadn't paid much attention to it in years. Setting that metric to something a little more reasonable (although still lower than Ticci’s) put an end to my easy wins from the first two days, but it also made the competition much more enjoyable and pushed me to exercise and move more than I had for a while. Competitions feel like a natural addition to the Apple Watch’s techniques for getting users to move more. Gamification of activity and exercise goals is always a winning strategy, and Apple’s implementation of this feature is well-considered and effective. There are definitely areas for improvement, but they’re all iterative – like making metrics more easily accessible from the graph screen and adding competitions with more than one opponent. For the time being, Apple has shipped a great feature which I encourage everyone to experiment with at least once. Competitions just might be the fuel you need to start living a more active life. 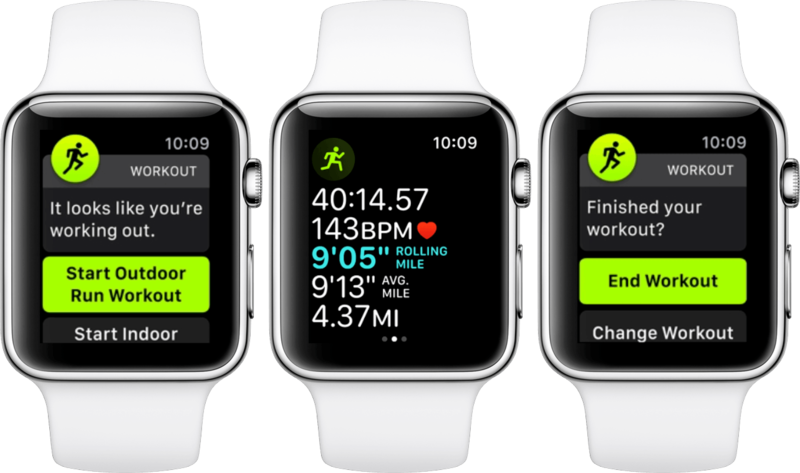 A relatively small variety of workout types in the watchOS Workout app are optimized for higher accuracy calorie burn tracking. In watchOS 4 these workout types were Walking, Running, Cycling, Elliptical, Rower, Stair Stepper, High Intensity Interval Training, Swimming, and Wheelchair. For each of these specialized types of workouts, Apple has done extended research and testing to improve metric tracking. Any other types of workouts fall into the “Other” category, and for those your Apple Watch will calculate metrics equivalent to a brisk walk whenever its sensor readings are not available. As of watchOS 5, Apple is adding two more types of workouts to that specialized selection: Yoga and Hiking. If you participate in either of these activities, make sure to pick the corresponding new type in the Workout app when you begin. For yoga sessions the improvements are mostly around calorie burn tracking, but the Hiking workout goes even further. Real-time elevation statistics will now be tracked for Hiking workouts, letting you know how many feet you've climbed. During outdoor running workouts you now have the option to set pace alerts for your average or rolling miles. Just choose a time goal for your miles and decide on a type of alert, then you’ll be tapped on the wrist with a pop-up after completing each mile. Average mile alerts will track your average mile time and tap you at the end of each mile. If you look at the pop-up you’ll see your current mile average as well as some large text informing you whether you’re ahead of or behind your target pace. Rolling mile pace alerts will track only your single previous mile time. After each mile you’ll get an alert telling you what your pace was for that mile, and a text block displaying whether you were ahead of or behind your target pace. Your rolling mile pace will also be displayed as one of the statistics on the Workout app’s main view during your workout, so you can always check and see what the pace of your preceding mile was. Pace alerts can be configured in the Workout app by tapping the “...” button in the top right corner of the Outdoor Run workout type (at the moment Outdoor Run is the only type that supports this feature). At the bottom of that screen you’ll see a “Set Pace Alert” button. Tap it to open the settings view for your alert, then tap the mile button at the top to set your target minutes and seconds for each mile (if you don’t set the target mile pace first you’ll find the remaining options to be grayed out). Next pick whether you want to be alerted with your average or rolling mile pace, then hit the back button in the top left corner to exit out. You’ll still need to hit that back button one more time to get back to the main workout view – I’m not sure why there isn’t a confirm button in the pace alert settings view to shortcut you back to the top level. You can’t configure more than one type of pace alert at a time, so you’ll have to pick between average and rolling. If you want to switch then just go back to the pace alert settings as described above and change the type. Once your pace alert is configured you’ll see the setting reflected on your Outdoor Run workout button in the workout selection view. Next time you start that workout you’ll get pace alerts after each mile. Alongside the new rolling workout metric, watchOS 5 also enables tracking cadence during running workouts. This metric is shown below rolling miles on the main workout view while you run. Cadence is a measurement of strides per minute, so you’ll see it in the Workout app as “SPM”. 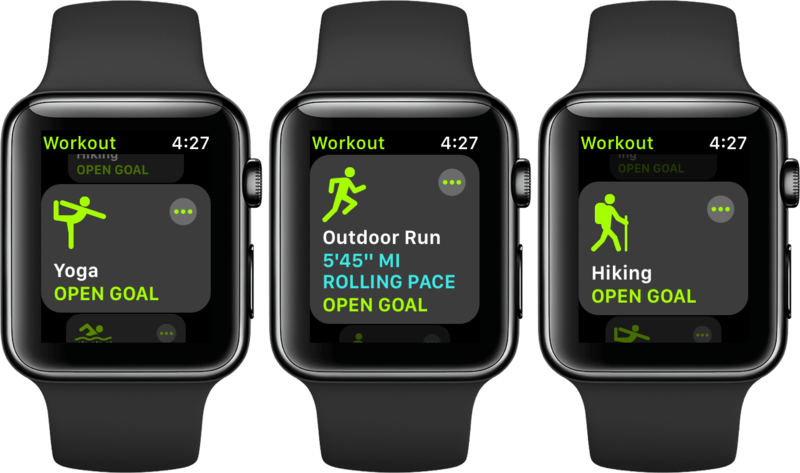 Cadence and pace alerts are a great addition to the Apple Watch’s workout tracking capabilities. In the future I hope to see Apple expand these options to other types of workouts besides Outdoor Run, but it makes sense for them to have started small for now. Tracking miles should be one of the easiest and most accurate metrics for the Apple Watch, so it’s not a big problem for it to automatically track pace by mile. For other workout types, such as swimming laps, this metric would be a lot harder to pin down accurately. With that said, I’m not sure why the Outdoor Cycling workout didn’t receive the pace alert feature. This seems like another natural fit, and since miles are already being tracked for that workout type it should have been trivial to add alerts. On a similar note, I’d love to see cadence tracking added to Swimming workout types based on stroke frequency. A consistent annoyance since the original Apple Watch has been starting a workout physically but forgetting to start a software workout on the Watch. In the past there was no way to get that lost data back, your workout just wouldn't be tracked. With watchOS 5 Apple is taking a shot at solving this problem. Automatic workout detection works like you'd expect it to: as your Apple Watch periodically monitors your heart rate and consistently monitors your movement, it can determine when your activity appears to be elevated. It's unsurprisingly a bit of a black box as to exactly how this determination is made, but the result is that your Apple Watch will now tap you on the wrist with a prompt when it thinks you may have started a workout. The prompt gives you the option to start a software workout in the Workout app, and if you accept that option it will tack on the time since it first detected that you might be working out. On the other end of your workouts, automatic workout detection will also try to determine when your workouts have ended. In past iterations of the system, if you didn't manually end a workout then it would just continue to track forever. If you receive the prompt that your workout has been detected as possibly complete and you manually confirm that assumption, your Watch will now remove the excess workout time since it first detected the drop off in your activity. In typical Apple fashion this feature allows no manual tuning, which in my case means that every day as I take my ten minute walk to work I'm unable to stop my Apple Watch from asking if I'd like to start an Outdoor Walk workout. When the prompt comes during those walks it is generally around the seventh or eighth minute, but it shows up seemingly randomly. I'll often not receive it for days at a time – during which I'll think maybe some sort of machine learning has determined that I don't consider my brief walks to be workouts – but eventually the prompt comes again. If the Apple Watch wants to silently count that walking time toward my workout ring in the Activity app then that's fine, but I have no interest in manually starting and stopping a workout every day as I walk down the street to work. You can of course disable the automatic workout detection alerts entirely, but I just want to turn them off for these specific situations. For other times, such as when I’m working out or running, I definitely want to keep the alerts on. Overall it’s not the biggest deal to be sometimes reminded unnecessarily, but the repetition of the alert paired with my never actually accepting it makes me feel like it shouldn’t be too hard for the Watch to decide to stop sending them. One of my main sources of activity comes from playing ultimate frisbee each week. I try to start workouts on my Apple Watch during these weekly pick-up games, but often I forget. This is a perfect case for automatic workout detection, and it’s worked quite well for me in my testing. There’s a lot going on in ultimate frisbee games, and I’m usually engaged enough in it that I don’t notice the tap on my wrist and thus miss the notification to start a workout. Thankfully, Apple thought of this possibility and accounted for it. If you miss one of the Apple Watch's automated prompts to accept that you've started a workout, you can still access it via the Workout app on your Apple Watch as long as your workout is still ongoing. This summer when I’ve noticed mid-game that I haven’t started a workout, and also failed to notice the automated alert, I’ve been able to open up the Workout app and be presented with a new temporary card at the top. The card looks like the other workout type cards, but this one shows how much time has been automatically tracked on your current workout, as well as what type of workout the Watch thinks it is. Tapping this card tells the Apple Watch that a workout is indeed occurring, and tracking continues as usual from there. Automatic workout detection is clearly a much-needed feature, and in practice I've been pleased with it overall. The feature is undoubtedly useful and will save a lot of headaches for users competing in new activity competitions or trying to keep their exercise ring streaks going. As more data points start flowing now that it is released to the public, I expect to see fewer false positive alerts over time. I still think that it could be useful for people to have a small amount of manual intervention in this regard, such as an added option in the notification to never ask you about this particular workout type at this time again. In the age of machine learning though, I expect Apple will just try to clean this up automatically instead of giving users manual controls. Use HabitMinder to track your daily routines and habits with built in session screens to keep you accountable.